Why do some people walk into a room and instantly command everyone’s attention and admiration, while others go unnoticed? What makes the difference? The answer is the “It factor.” Wouldn't it be nice if everyone could develop that "It factor" within him or herself? Author Leesa Rowland offers up some answers and advice for developing your charismatic personality in her new book: Discovering the It Factor Within You: Developing your Charismatic Personality. 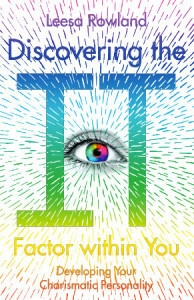 I had the pleasure of participating in the book tour and reviewing Discovering the It Factor Within You. What did I think of Leesa Rowland's book? Read the review and enter to win either a $25 Amazon Gift Card or a Paypal gift in the book tour giveaway! Quick Summary of Discovering the It Factor Within You: Developing your Charismatic Personality by Leesa Rowland. Discover the Formula for Developing Your “It Factor.”Have you ever wondered why two people with the same humble background and similar education have dramatically different results with their careers and lives? Why some people are remembered long after they are gone? The “It Factor” is a combination of charisma, self-discipline, enlightenment, spirituality and karma. In her new book published by Kismet Publishing, Discovering the It Factor within You: Developing Your Charismatic Personality, Leesa Rowland shares simple steps to learn how to discover and develop your inherent charisma and personal and authentic uniqueness. What sets this book apart is that it includes the spiritual and religious aspects of charisma, not just the science. The author offers insight into the "It Factor" within each of us--in a way that appeals to each of us differently. While, certainly, some people seem born with a certain, natural charisma; the author illustrates that that same quality may be found inside everyone with a little attention to development. As Rowland explains the science and spirit of the "It Factor"--she incorporates resources from a variety of scientific, religious, philosophical, and real-life sources. While I enjoy reading the science behind our personalities--I also enjoy viewing the concepts from different thought perspectives. I enjoyed following the author as she explored the "It Factor" from various studies--including spiritual and personal experiences. The book wanders from point to point--with an ultimate direction in mind. I struggled with the book at times as I felt that we were revisiting points or simply wandering from idea to idea. Ultimately, I realized that the author was simply using multiple reflections and ideals to focus on the ultimate goal of helping readers recognize--and embrace--the "It Factor" already dwelling within. Discovering the It Factor Within You by Leesa Rowland isn't the typical "self-help" book. Self-help type books are a tough sell to me. So often, the information offers little value--and I find myself finding fault with the science or the underlying beliefs--or I simply find the authors to be condescending or fake. Initially, I struggled to settle into this book. The reading was a little heavier than I had anticipated--or I was a too distracted to focus. Then. It happened. The author began to make the book personal. She opened up her life story--her failures--her tragedies--and her stories gave the book a new voice. While I didn't agree with every point made throughout the book--I was able to respect her viewpoints and accept the validity and the value of her advice. Would I recommend Discovering the It Factor Within You by Leesa Rowland? While I haven't focused on following the author's suggestions to rate their success in my life--I can certainly identify some promise in her advice. The author revisits points again and again throughout the book to drive them home into the reader's mind. These frequent visits may seem a little redundant at times--but, they really do push the reader toward an understanding of the "It Factor"--and the value in summoning it. Will the book work for you? I think it will open your eyes to some new possibilities and is worth adding to your motivational resources! Leesa Rowland is an actress and animal advocate who went from the family ranch in Texas to the bright lights in Hollywood and New York. After earning her broadcast journalism degree at Texas Tech, Leesa went to Los Angeles to study acting at the Stella Adler Studios. She has had a successful career in acting, and has a vast cult following for her roles predominantly in horror movies. She is primarily known for her role as Victoria in Troma Entertainment’s “Class of Nuke ‘Em High,” parts 2 and 3, Starz Channel’s “Return to Nuke ‘Em High” and as Phyllis in Travis Campbell’s thriller “Slaughter Daughter.” She is a member of the International Women’s Writing Guild. Leesa has studied method acting, yoga, spirituality, charisma, Buddhism, and metaphysics for over twenty years. Meet Discovering the It Factor within You Contributor Robin Cofer was ordained “Swami Pranavananda” in 2007, by Sri Goswami Kriyananda, the spiritual preceptor of The Temple of Kriya Yoga. Robin is a priest carrying the spiritual flame of Kriya Yoga, a lineage that includes the iconic gurus, Babaji, Yogananda, and Sri Yuktseswar. She was confirmed in the Episcopal tradition at Saint Thomas Church on Fifth Avenue in New York City in November of 2014. Robin is adept in Kundalini Yoga, certified by the master Yogi Bhajan. She holds multiple certifications, including Hatha and prenatal, and was trained by Pattabbi Jois, the master of Ashtanga Yoga in Mysore, India. Robin has taught yoga, meditation, sacred chanting, and spiritual psychology internationally for nearly twenty years. She holds certifications in Qigong, Reiki, Nia, Far Infrared Onnetsu Therapy, and holistic health from the American Association of Drugless Practitioners. She is a member of the International Women’s Writing Guild. Thank you for having Leesa Rowland on your site.